Do you have any questions about your child’s eye health? 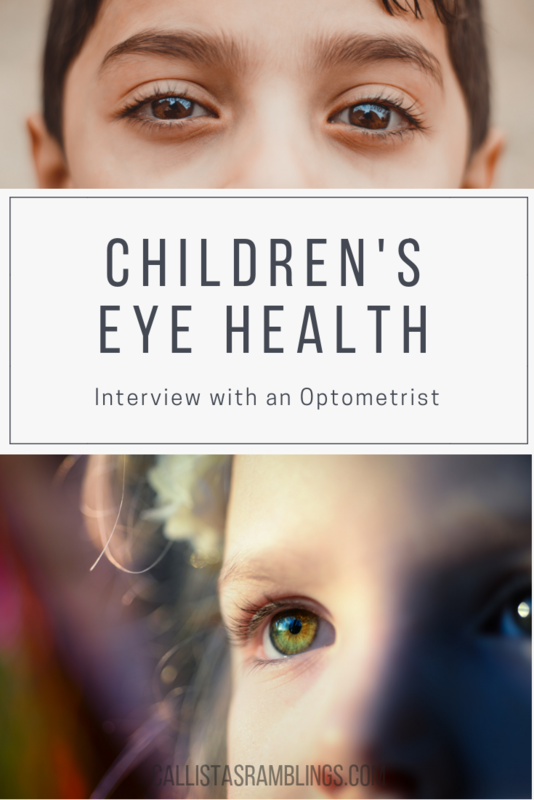 I was able to interview an Optometrist (eye doctor) to get answers to some common questions parents might have about their child’s eye care. At my school, in Kindergarten, they send home notices recommending we get our children’s eyes checked and there are certain optometrists who will provide free glasses if your child needs them and is in Kindergarten. Recently my girls went to the eye doctor for a check-up. I explained what would happen beforehand and the optometrist was very friendly (I had her when I was a kid) and explained things as well. They got to watch Dora while they waited and felt at ease through all the tests. They were rewarded with a prize from the prize box afterwards. Eye health is very important – don’t neglect it! Dr. Patrick Quaid, Optometrist at IRIS The Visual Group in Guelph, Ontario completed his Fellowship with the USA based College of Optometrists & Vision Development (COVD) and has attained USA Board Certification designation. As he has personally lived it, Dr. Quaid is passionate about spreading knowledge on the impact that abnormal vision can have on a child’s potential to learn and the importance of treating these conditions properly as early as possible. Question 1: Why is it important for a child to get their eyes examined before they start school? 80% of learning is vision based and especially reading depends very much on not just having clear vision but also properly working eye muscles that co-ordinate the eyes together. A recent paper we published in a peer reviewed journal has shown that reading speed and accuracy is correlated to several clinical measurements which reflect how well the eyes are co-ordinated together. Of note, over 85% of the children with reading based learning difficulties saw 20/20 on presentation. Thus, is it very important for parents to understand that simply having 20/20 vision certainly does not rule out ocular problems. In Ontario for example, where children’s eye examinations remain a government insured service, it is of great concern that only 40% of children will have had a full eye examination by the end of high school. It is advisable that the first eye examination occur by 12 months and every year thereafter until 20 and then 1-2 years thereafter. Question 2: If a child’s family wears glasses, are they more likely to need glasses? Both genetic factors and environmental factors play a role in the development of one’s vision. We are not born with good vision, it is stimulated and trained, 0-2 being the most important time. Eye turns (called “Strabismus”) and lazy eye (termed “Amblyopia”) certainly have an hereditary component with children of parents with such conditions being at a 20-40% higher risk of developing similar issues. However, in the absence of these issues the heredity pattern is not as clear-cut. We know for example that with near-sightedness or myopia (i.e. distance blurriness) that this does not usually occur until about age 5-7 (whereas far-sightedness or hyperopia is usually is picked up much earlier). There is some mounting evidence from research done in the UK and USA that myopia may be as a result of prolonged near work and reduced exposure to distance vision. For example, a recent large scale study in the UK showed that higher degrees of near-sightedness were associated with children who spent less time outdoors. It is clear that our vision tends to adapt to our surroundings, thus with technology being so prevalent in our society, it is important to get your child to take frequent breaks from their devices and computers, and (heaven forbid)……play outside! Question 3: Why does my child need an eye exam yearly? Why can’t I just bring her in if she is having trouble seeing? The main reason for the annual check-ups is that if your child is having issues they are quite simply unlikely to complain (especially children under 6-7 years old). After all, how can someone complain that their vision is “abnormal” if they have never seen normally? This is the same reason that hearing checks are done from a young age. Interestingly, hearing checks are mandatory (and some schools even prohibit your child attending school without proper immunizations now), it is certainly interesting that eye examinations have not been given the same level of respect given that 80% of learning is visually based. For more information readers are encouraged to visit www.iris.ca and download the binocular vision brochure in the children’s section. Another useful link is www.visionhelp.com, a wonderful resource for parents of children with eye co-ordination issues. Question 4: Is there anything I can do to prepare my child for her eye exam? We at IRIS usually advise the parents to prepare the child for the possibility of having eye drops as this can be the biggest source of apprehension for the child. Mom or dad could even practice with artificial tears prior to the appointment. It is vital to have the drops done especially in cases of learning disabilities as children can have moderate amounts of far-sightedness but be able to compensate for it. However, doing so will leave their eyes under strain and likely lead to a significant reluctance to do near work for prolonged periods of time (hence the overlap with ADHD symptoms). If the drops are not done and your child is learning disabled, we suggest you ask your eye care professional to consider doing them or discuss the reasons why it is not being done. It is also important to re-assure your child that there are no “needles” as the term “doctor” in some children often invokes these fears. Question 5: How do I choose an eye doctor for my child for their first examination? You cannot beat recommendations from family and friends. If you don’t have any, you should look for a doctor that has up to date equipment like retinal photography, and spends enough time to not only examine your child but answer any questions you might have. Your eye doctor should always develop a comprehensive treatment plan that may include a specific eyeglass lens technology and sun protection. The most important advice I can give here is not to base your decision on cost. After all, your child’s vision is more important than saving a few dollars. In most provinces children’s eye examinations are insured by the provincial health plan so you can use these savings to invest in proper glasses which provide good quality vision and are supported by a comprehensive warranty. For example, at IRIS we warranty our frames for two years and our fully coated lenses for one year regardless of whether the damage is the child’s fault or not. This type of warranty is vital with children especially, as they can be quite hard on their glasses. A big thank you to Dr. Quaid from IRIS for answering my questions. I hope you learned something of value. Please share your experiences with children’s eye health or what you learned from this post in the comments!